Eggs have long been a staple of the American breakfast, but for a lot of cooks, they only come in a couple of varieties. Eggs are typically scrambled or fried and served either plain or with cheese or maybe hot sauce. While good old fried eggs are indeed tasty, there is still quite a bit more that can be done with this early morning favorite. 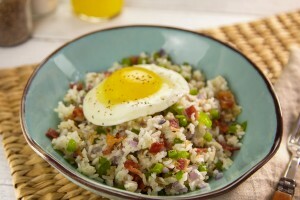 In this top ten egg dishes article I will provide some simple recipes to help you spice up your morning! People from Mexico or the American border states are probably already familiar with this classic egg dish. Start by cooking an egg to your preferred temperature and adding cheese, hot sauce, beans, onions, tomatoes, and serve on a warm corn tortilla. Deviled eggs are made by boiling eggs until the yolks are fully cook, shelling and halving them and whipping the yolks with mayo or mustard until they are creamy. These delicious little treats are very versatile, you can do a lot with eggs yolks by adding different relishes, spices or other ingredients. Once the whipped yolks are replaced serve them as an appetizer or breakfast entree. Boiled eggs with habanero lime salsa are made by simply adding habanero lime salsa to boiled eggs. They can be served a number of different ways and either hot or cold. 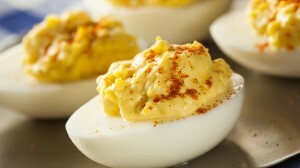 You can also whip them with mayo and onions to make a spicy egg salad! Asparagus soldiers are a great companion to savory fried eggs. They are made by baking asparagus with your favorite bacon (or similar meat such as pancetta). For best results serve with a Hollandaise sauce. Often, fried rice is served with scrambled eggs mixed throughout to provide extra savoriness and nutrition, but did you know that fried rice can also make a great breakfast? Simply make your favorite fried rice and serve with a fried egg and your choice of breakfast meat, either on the side or mixed in for a delicious breakfast bowl. 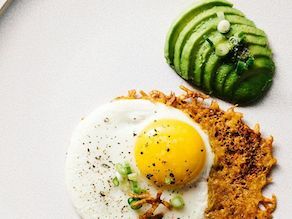 Eggs and hash are a favorite in the U.K. and has gained some popularity in America. Start by cooking hash browns in a skillet, then stir in corned beef, salt, pepper, and diced bell pepper. Eggs in a basket are a big part of the farm-boy breakfast tradition of the American southeast. Using a cookie cutter make round holes in regular slices of bread. Next, melt some hot butter and begin frying the bread in a skillet, once the bread had begun to brown pour the hot butter in the hole and add the egg. Be careful not to crack the yolk as you flip it! Baking is an underutilized way to cook delicious eggs. All you have to do is add eggs to a non stick muffin pan and bake at about 375. For best results add a tablespoon of cream and a little of your favorite spice or seasoning. To make a savory dutch baby with egg all you have to do is replace the traditional fruit filling of a dutch baby with fried egg and your favorite breakfast meat or veggies. 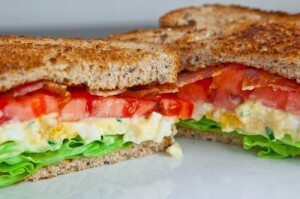 Last but not least we have the egg lettuce and tomato sandwich. There are a lot of ways to make this one but my favorite recipe calls for a few slices of avocado and warm 7-grain bread. In this article of the top ten simple morning egg dishes, we have covered some the best ways to make use of those nutritious and flavorful eggs. The great thing about most these recipes is that they allow for pretty much any style of egg, weather you like them over easy or fried extra hard. Until next time, bon appetit!